It would be nice to think that Einstein's equation became famous simply because of its fundamental importance in making us understand how different the world really is to how we perceived it a century ago. But its fame is mostly because of its association with one of the most devastating weapons produced by humans – the atomic bomb. The equation appeared in the report, prepared for the US government by physicist Henry DeWolf Smyth in 1945, on the Allied efforts to make an atomic bomb during the Manhattan project. The result of that project led to the death of hundreds of thousands of Japanese citizens in Hiroshima and Nagasaki. Is this saying that the equation was first connected to the bomb in 1945? The first bomb had already been built by then. I am not sure the equation did have much to do with the atomic bomb. The energy released by uranium fission was explained by the electrostatic potential energy. That is, protons repel each from their like electric charge, and so a lot of energy must have been needed to bind them together in a nucleus. Splitting the nucleus is like releasing a compressed metal spring. Understanding the energy of H-bomb requires considering the strong nuclear force. One of the first applications of quantum mechanic was George Gamow figuring out in 1928 that protons could tunnel thru the electrostatic repulsion to explain fusion in stars. The relation between mass and energy was first given by Lorentz in 1899. 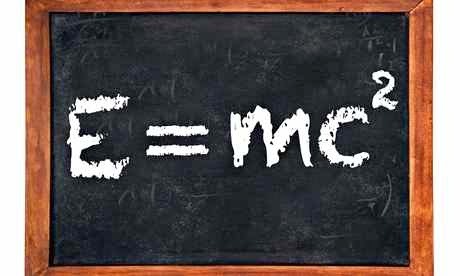 He gave formulas for how the mass of an object increases as energy is used to accelerate it. This was considered the most striking and testable aspect of relativity theory, and it was confirmed in experiments in 1902-1904. Einstein wrote a paper in 1906 crediting Poincare with E=mc2 in a 1900 paper. In nuclear reactions, energy is NOT converted into mass. It is imprecise to say that it is. Gluons have zero invariant mass. Nuclear reactions involve changes in binding energies. You are referring to the difference between rest mass and relativistic mass. Some textbooks define mass one way, and some the other way.